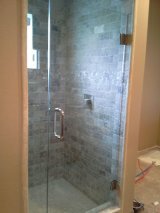 I do custom shower doors that are framed and also heavy glass frameless shower doors. 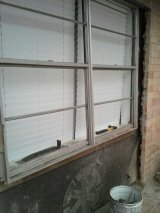 I cut brick away from window and removed and reframed wall to accommodate a pair of French Doors. 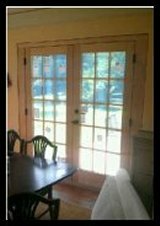 Pair of French Doors after removing a pair of windows and rebuilding the wall. Photo taken before brick mold installed. 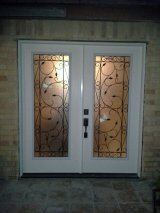 Interior trim of a pair of Jeldwin French Doors in Bayview. Heavy Glass shower door and panel, Clear Glass Brushed Nickel Hardware.